Cute day dress paired with flat sandals keeps it casual. Too casual, and too short! Looks like a swim suit cover-up. I’m taking my daughter to the American Girl store today, so I wanted to wear a dress for this special occasion. On the right I’m wearing a simple cotton day dress, but it is too short and it looks like a swim cover-up, especially since I paired it with flip flops. On the left I am wearing a better version of a day dress. The belted waist is more slimming and the longer hemline is more appropriate. 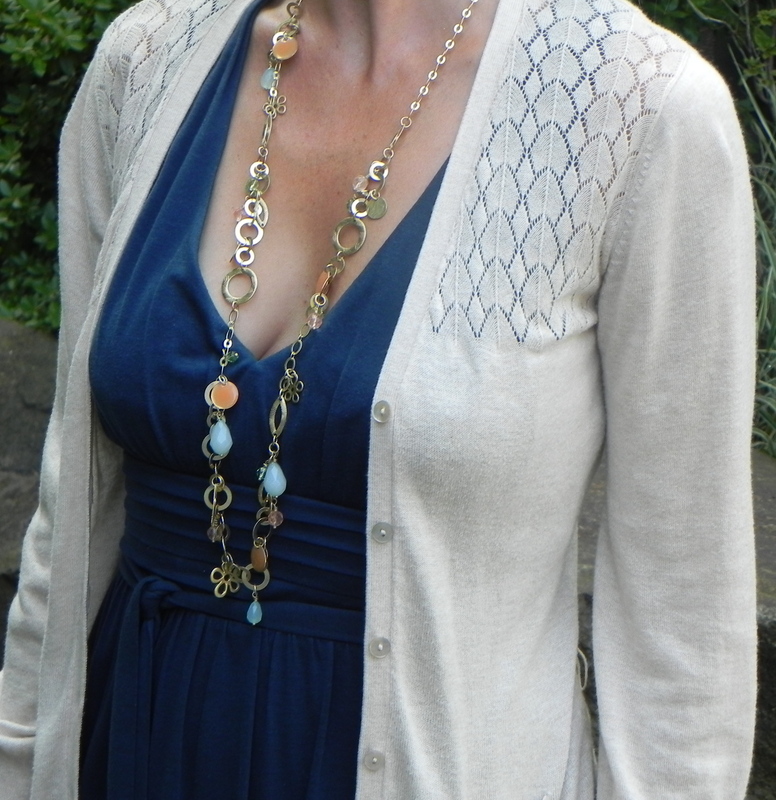 In case I get cold, I added a cute cardigan and for visual interest I added a cool necklace. I also replaced the flip flops with my favorite sandals from Target. Now, off to spend $$$ on doll clothes, seriously?! A cardigan with some details adds interest. The cardigan will come in handy in the air conditioned store. The straps add an unusual twist (pun intended!). I thought about heels, but since I was going to be walking so much decided on flats. Wedge heels would be cute too!